This page is about the aircraft F-80C-10. For the other version, see F-80A-5. The F-80C-10 Shooting Star is a Rank V American jet fighter with a battle rating of 7.3 (AB), 8.0 (RB), and 7.7 (SB). It was introduced in Update 1.33. 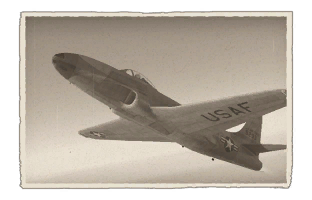 It is found under the F-80 bracket, immediately after the F-80A-5. The greatest performance upgrade from the A-5 to the C-10 is that the C-10 comes with WEP. This additional power significantly increases acceleration, allowing you to match that of the British Meteor series. It also allows for a last-resort method to escape if you happen to get jumped on. With the WEP comes with fuel management. If you opt for maximum performance by selecting 9 minutes of fuel, you will run out of fuel quickly if you choose to WEP for the entire match. Like most American props and tech, your best option to attack is Boom and Zoom. At the start of the match, fly out towards the edge of the map. Make light climbs at 2.5 degrees to 300 meters (1,000 ft) and dive down to sea level to convert it into speed. Rinse and repeat until you have reached 400 km/h (350 knots), then zoom climb at 30 degrees. Once you have slowed down to 287 km/h (250 kt), continue to climb at a solid 15-20 degrees. Optimally, you should have between 3,300 - 4,500 m (11,000 - 15,000 ft) depending on how high the highest enemy is, before turning in towards the area of conflict (continue to climb or maintain altitude). Only once you have selected a target should you dive and make your pass. Always keep your energy high, whether it be speed or altitude. Your greatest advantage is speed, as the F-80 is faster than almost every other jet at its rank. Defensive flying and rolling scissors is an option with the hydraulic boosters upgrade, however, you risk losing too much energy, and your attacker may choose to break off and try again while you are struggling to maintain lift. If you are given an awkward firing angle (e.g. : you are directly vertical to your enemy and must pull 10G+ to line up a shot) or you fail to destroy them on your first pass, slowly pull your aircraft back up into a straight vertical climb to recover as much altitude as possible. If you persist on knocking out your target, you risk crashing into the ground from control stiffening or getting strafed by another enemy because you are losing your energy in a dogfight. Good acceleration and climb rate. 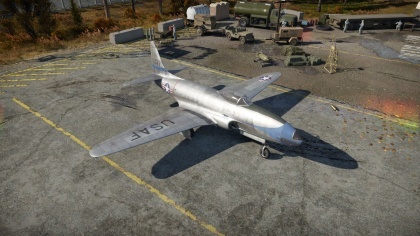 Can outturn Mig-15's when the need arises. Poor turn rate at 4-500 km/h. Overall useless in a uptier, it is just too slow. Just 100 seconds of WEP in RB, it is only there for emergencies. This page was last edited on 6 April 2019, at 19:19.